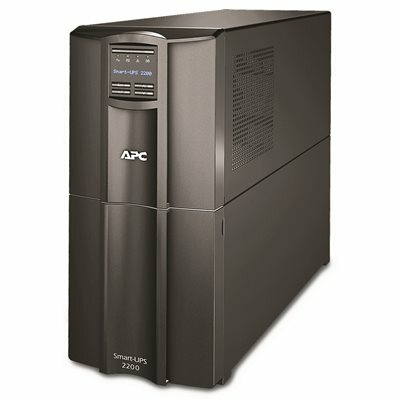 A popular UPS for servers, storage and networks. Trusted to protect critical data and equipment from power problems by supplying clean and reliable network-grade power. Provides extremely high efficiency at low, medium and high load levels making it ideal for multi-core or virtualized servers with varying load consumption. Sealed lead acid battery provides 3-hour maximum battery recharge time. Check utility status and adjust settings on the easy-to-use LCD interface. A bright display provides clear, accurate information in multiple language options, and intuitive navigation keys make it simple to configure settings. This UPS can be configured to shut down and reboot connected equipment in a pre-determined order, and a SmartSlot lets you use a network management card to customize UPS capabilities. APC Smart-UPS SMT2200, CD with PowerChute Business Edition software, documentation CD, Smart-UPS signaling RS-232 cable, and USB cable.